Qualification & Experience : B. E (Electrical / Electronic/ Mechanical) from recognized University with at least 2 years of experience in related field or passed three years Diploma with 5 years experience , preferably in Hotel industry. Excellent command over spoken and written English. The candidates should be dynamic with good leadership quality, pleasant personality and Computer literate. Qualification & Experience : Graduate with an excellent command over both spoken & written English. Must posses a professional qualification in secretarial science from any recognized institute with a minimum of 3 years work experience in any reputed industrial or business house. 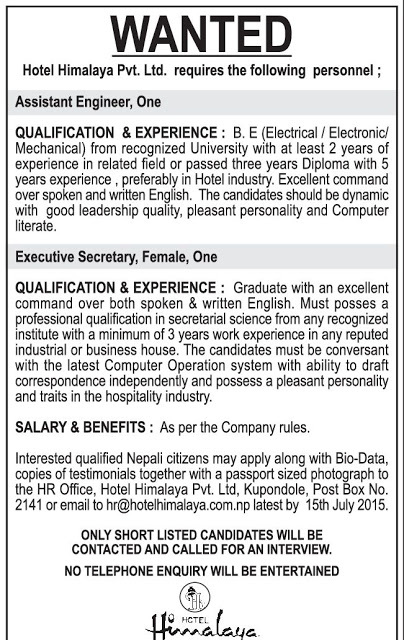 The candidates must be conversant with the latest Computer Operation system with ability to draft correspondence independently and possess a pleasant personality and traits in the hospitality industry.